No Ordinary Girl is about an Australian woman’s ambition to achieve her greatest sporting dream. Her autobiography recaptures her journey from learning to swim through to receiving a silver paralympic medal in the presence of family and friends at the Sydney International Aquatic Centre. The story since the silver medal is of struggle and turmoil. Having enjoyed a successful career in the pool, Tamara’s struggles with depression, anxiety and obsessive compulsive disorder resulted in trialling numerous medications, hospitalisations and 22 electroconvulsive therapies. With mental illness sabotaging Tamara’s success in the pool, the years following her retirement from an elite sporting career have seen an ongoing battle to overcome a life plagued by both physical disability and psychiatric disorders. 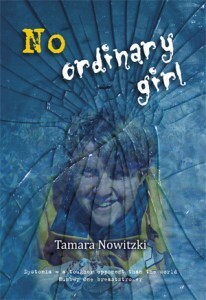 No Ordinary Girl was written not only to inspire and encourage readers to strive towards their own personal goals and ambitions, but also to reduce the stigmatisation of mental health disorders and to demonstrate that they can strike anyone at anytime. Through this book the author hopes to increase awareness of the issues both mental health disorders and physical disability present to encourage positive community response and acceptance. This book provides a deep insight into daily living challenges endured by a sufferer of both neurological and psychiatric illness. No Ordinary Girl hopes to promote understanding and empathy. It is simply told as it is.